Lawmakers recognize the life and public service of Paul Poberezny. Experimental Aircraft Association (EAA) founder Paul Poberezny loved all things airplane — building, restoring, and flying the aircraft. The former military pilot, who died less than two months ago, started a club for recreational flying enthusiasts 60 years ago with just 35 people in Milwaukee. Poberezny moved the EAA to Oshkosh in 1983; the aviation club has grown to over 180,000 members in more than 100 countries. 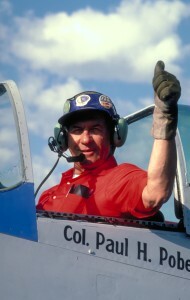 Paul Poberezny retired from EAA as president in 1989, but lived just a couple of miles from EAA headquarters. About 1/2 million aviation enthusiasts from all corners of the state, across the nation, and 60 countries gather in east central Wisconsin for AirVenture, bringing an estimated $110 million in economic impact to Oshkosh-area counties each year. Wittman becomes the busiest airport in the world for the week of AirVenture.